Many engineers and contractors today are facing increasing concern about comfort (residential) cooling units being misapplied to computer room applications. There is no shortage of misinformation defining the appropriate use of air conditioning equipment and specifying the delineation between comfort cooling applications and computer room applications. To make sense of it all, it helps to understand the history and the evolution of the various requirements for computer room cooling. These are fast changing requirements and many engineers, authorities having jurisdiction (AHJs), and end users are inadvertently misapplying comfort cooling units in computer rooms simply because they are not aware of the benefits of the application specific units or the regulatory aspects of the application. They are not designed for the tight energy efficient control required in the computer room. They may not meet the requirements of your local conservation code. They do not meet the federally mandated energy efficiencies and have not been submitted to the DOE for acceptance in this specific application. 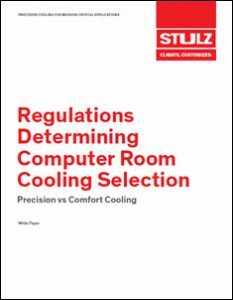 The new white paper from Schulz walks readers through the ins and outs of the changing requirements for computer room cooling, and helps them choose the best cooling options for their businesses.